Celebrating and inspiring philanthropy within Atlanta’s creative community. Our purpose is to collect and donate toys to the less fortunate. Enjoy a private dinner provided by the Everyone Eats Foundation followed by a night of. 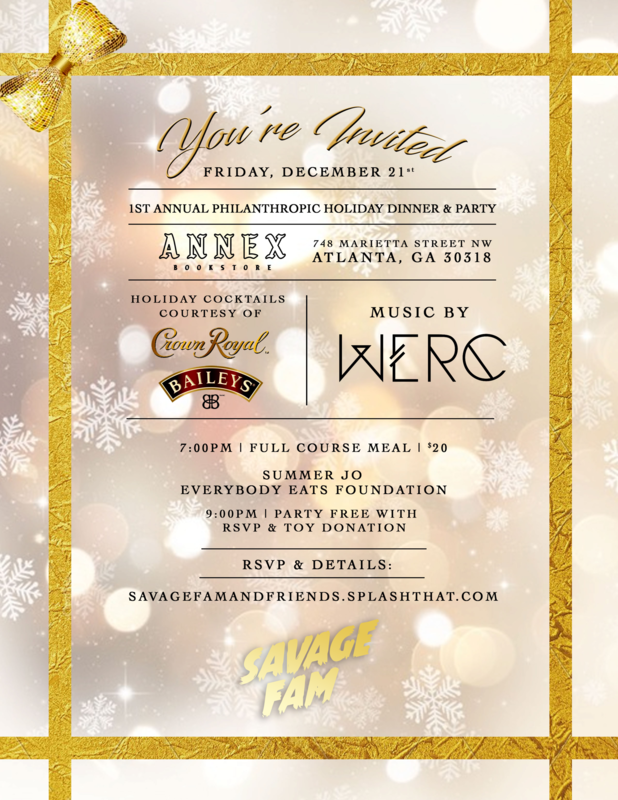 ATLANTA’s most notable DJ Crew: WERC Crew will provide the dance rhythms for a joyous, festive night coupled with cocktails courtesy of Crown Royal and Baileys; set to a cosy, decorative holiday aesthetic. Dinner courtesy of Summer Jo of Everyone Eats Foundation. Party begins. Free with RSVP. Must bring a toy for open bar. Cocktails courtesy of Crown Royal and Baileys. Live stream and fund raiser courtesy of Live Hip-Hop Daily.